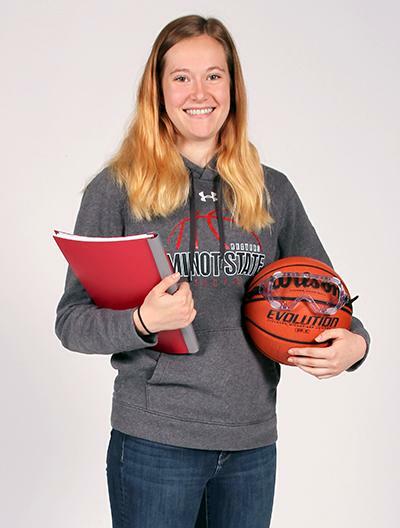 Haley is a member of the Minot State University women’s basketball program, but that isn’t the only extracurricular activity this Colorado native is involved in. She is the Student-Athlete Advisory Council vice president and an orientation leader. I originally chose Minot State because I was interested in the basketball program. But, I really liked the science facilities after touring the University. They are awesome. I’ve been able to get connected in the science department and have already done some undergraduate research. That will help me eventually do graduate research. I feel like I have to say chemistry, but it’s probably microbiology — the lab was really fun. Naomi Winburn ’13 and Christopher Heth ’99/’04. Naomi encouraged me to continue in the science field and Chris really connects with you in class.